Of all the indie bands with some sort of animal in their title, Grizzly Bear might be the top dogs. After all, can Deerhoof, Deerhunter, Caribou, Panda Bear or even Animal Collective claim they are co-headlining a show with the Los Angeles Philharmonic? Nay. It is just the Brooklyn-based quartet who will share a stage at the Walt Disney Concert Hall for a one night only performance with the L.A. Phil Saturday, March 1. The two won&apos;t actually jam together, but will split a chunk of time, each musical outfit playing against each other&apos;s collective genius. "The first half of the program features the Los Angeles Philharmonic performing orchestral pieces specifically chosen to reflect the music that inspired Grizzly Bear to pursue their own musical endeavors," the Phil said in a press release. "The second half of the program features Grizzly Bear performing a full set that includes songs from their most recent release Yellow [House]." 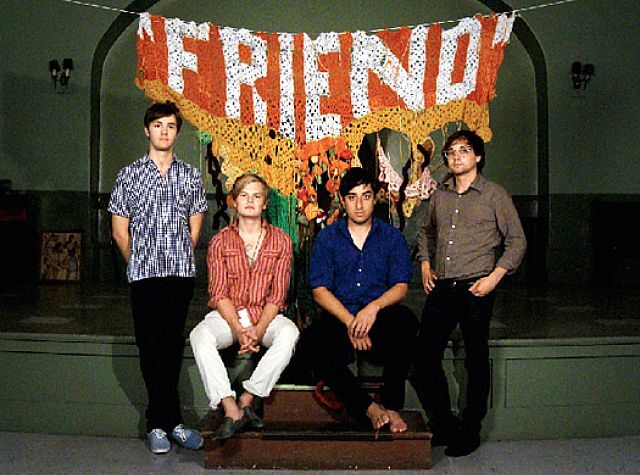 They could also play some ditties from their even more recent release, Friend EP, an insanely brilliant collection of new (see below) and reworked songs from the NYC band who don&apos;t shy away from whistles, banjo&apos;s and laptops in their quest for musical brilliance. This isn&apos;t the first time some members of Grizzly Bear have taken to the wooden stage at Walt Disney. On January 8, Daniel Rossen, guitarist and co-lead singer of Grizzly Bear, was joined by a slew of other indie rockers at the Concrete Frequency series "to examine and celebrate the elements that define a city." Nor is it the first time an indie rock band has played with the philharmonic. Bright Eyes strummed their Land-Locked Blues at the Hollywood Bowl in September, The Decemberists showcased their Sons & Daughters at the Bowl last year and Belle and Sebastian Slept the Clock Around in 2006 with the Phil. Tickets are between $24 and $34 and go on sale Saturday, Feb. 2 at LAPhil.com; via (323) 850-2000 at 10 a.m.; or at the box office, which opens at noon on Saturday. The Walt Disney Concert Hall is located at 111 S. Grand Avenue.